This entree evolved from the blueberry French Toast and is repeated because the directions for the sauce are a bit different. Trim crusts from bread and discard Cut the cream cheese into 1 inch cubes. Arrange half the bread slices in a buttered baking dish to cover the bottom of the pan. Scatter the cream cheese over the bread and top with the peach slices. Arrange remaining bread slices over the top. Whisk together eggs, syrup, milk and vanilla, and pour over bread. Sprinkle nutmeg over top. Let chill, covered, overnight. Bake, covered with foil, in a preheated 350 degree oven for 30 minutes. Remove foil and continue baking approximately 30 minutes longer or until browned and set. Remove from oven – let rest covered with a towel for about 10 minutes before cutting. Sprinkle with powdered sugar and then drizzle sauce over top. Garnish with whipped cream. Combine scant – 1 cup sugar, 2 tablespoons cornstarch in a saucepan and whisk together, and stir in 1 cup Glenora Peach Spumante. Cook over moderately high heat, stirring, until mixture thickens slightly. Stir in about 1 heaping cup pealed sliced peaches and simmer, stirring occasionally, for approximately 10 minutes until thickened. Add 1 tablespoon butter and stir the sauce until the butter melts. Note – in making the sauce, one can substitute water for the Peach Spumante and add a tablespoon of peach jam for extra flavor. One can also just puree a small amount of fresh peaches and add to sauce for additional flavor. 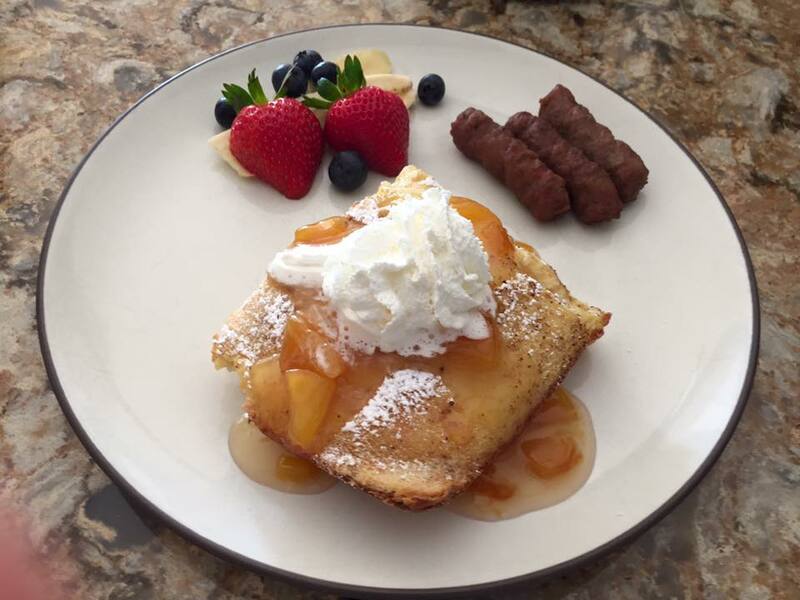 No Replies to "Baked Stuffed Peach French Toast"